The Japanese Earthen Plaster Exchange starts with two Americans training with plaster masters in Japan. 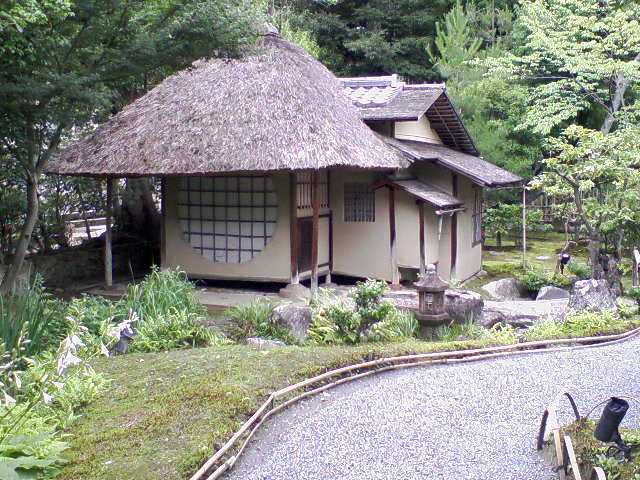 Ihouan tea house at Kodai-ji temple in Kyoto was built in the 17th century. The wall is completely earthen, and no more than an inch and a half thick. Our training, shared through workshops and through online resources, will provide an infusion of time-tested techniques in the use of earthen finishes for the building sector. Our first project involves two Americans studying under masters for a combined period of two and a half years, six days a week, as is their working custom. Emily Reynolds will be in Kyoto for two years. A number of years ago, she studied the traditional craft in Japan for a year before being accepted as an apprentice to Master Asahara Yuzo. His company, Shikkui Asahara, is in Kyoto, the birthplace of the tea house. It is now headed by his son, Asahara Ichiro. It is one of very few plastering crews in Japan that work exclusively with natural materials, using only traditional tools and techniques. She will be returning to Shikkui Asahara in April of 2016. To further her practice, she will train at the Kyoto Plasterer’s Guild Academy two days per week, while working with the crew on site the other four days. Angela Francis will be joining Master Takemoto Shigenobu in Kanazawa, a town on the western coast of Japan which is known nationally as “Little Kyoto.” She is vigorously studying Japanese in order to make the most of her experience. Her training will also begin April, 2016, for six months. We will spread the craft to increase the appeal of earthen finishes. We will each keep a blog detailing what we learn, including videos and images, while we are training in Japan. Upon return to the U.S., we will host workshops to pass on the techniques that create Japan’s earthen walls. We will incorporate our training into our own work, spreading the skills to coworkers. We will conduct workshops on basic skills by ourselves, and invite Japanese masters to teach advanced plastering workshops. We will foster relationships so that others may also learn the techniques from the source, in Japan. In this way, JEPE will continually work to broaden the bridge of interest and access to this craft. We will bring this craft into Japanese gardens and joinery structures, where they authentically belong. We will educate and train at every opportunity, to expand the use of earthen plasters and earthen wall systems.